touch our souls when they die. heart and soul of Sandy Meadows Farm. Zues ~ Much more than a dog! Zues was born at our farm in 1990 (same year as Undun Wind). They grew up together and I'm sure many of you remember the 'infamous' photo of Undun Wind chasing Zues in the paddock having a great time. Swat Fly Ointment used that photo in their national ads for a couple years and there was even a painting done of that photo. Zues has been the BEST dog any family could ask for. He was a constant companion to us for 17 years; a babysitter for all our foals; our 'foal monitor' and he only missed one foal in all 17 years! Zues, I'm sure you are in 'Dog Heaven' watching over the foals up there. We miss you more than you can guess. You were absolutely the best dog and friend anyone could ask for. 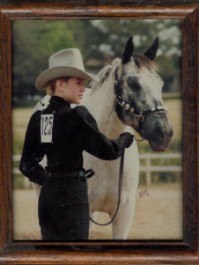 "Reba" was a Blue Roan Leopard Appaloosa mare. Great Foundation Appy bloodlines of Joker B. "Reba" was a terrific show mare in her day. She won over 100 First Place & High Pt. trophies in her show career. She passed away this year at the age of 30. You will be missed so much! You were the beginning of it all girl! She is the dam of Joker B Undun, grulla blanketed stallion who qualified for App World Show as a 3 year old in Working Cow Horse and Reining; and of Unduns Adonis a black blanketed colt. Both these colts are standing at stud and in or going to Mexico to be the cornerstone of an Appaloosa breeding program. She is also the dam of the Dun blanketed Appaloosa gelding, Rebas Undun Finale and our last red roan appy filly, Rebas Undun Encore, AKA Corry. Reba has our undying respect and devotion. She was a great mare who has added so much to our family. All our kids, grandkids and even nieces and nephews got to ride and show this mare! Rest in Peace! Roxy was purchased in 1988 as a weanling filly at the Sonny Dee Bar dispersal sale in Iowa. She was one of the cornerstones of our breeding program for the past 16 years. She is a granddaughter of Skipa Star, AQHA World Champion and Blondy's Dude, AQHA Champion. 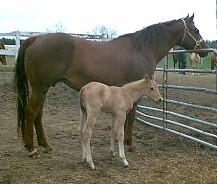 Roxy has several futurity winning foals in both Western Pleasure and HUS. She left a huge legacy of Undun Wind foals who have done everything from being show horses, lesson horses and even one therapuetic riding horse. Roxy died from complications of colic with a twisted stomach. She left behind a gorgeous 3 month old bay colt who will carry on her legacy, as well as several older sons and daughters. Roxy, you are missed everyday! We were proud to share our farm with such a great mare. We had to say goodbye to another mare who has contributed greatly to our breeding program over the years. 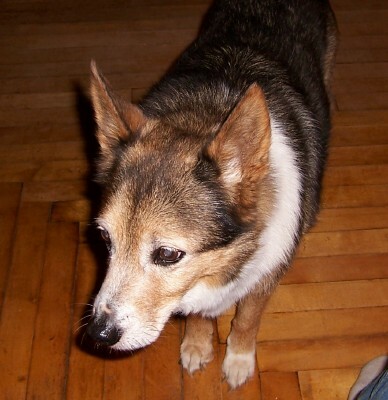 Classic Correlation crossed over the Rainbow bridge in mid August of 2004. Classy was a proven show mare herself with 5 World & Res. World Championships in IBHA and ABRA in Youth and Open events. She was Res. Honor Roll Aged mare too. Classy also had AQHA pts. This mare went on to produce top show horses including Unduniable Classic, Unduns Country Girl, Sheza Classy Won, Unduns Country Classic, and our latest, Unduns Dartagnon. Classy is greatly missed here at Sandy Meadows Farm. Classy girl, you will be in our hearts forever. 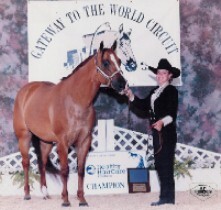 1990 16.1 Hand Chestnut AQHA mare who was an AQHA Performance pt. earner and multiple futurity winner in WP. She is by Sir Joak Van who had both AQHA Halter and Performance pts by Sir Johnny King, again with both Halter and performance pts. She has Weiscamp, Bonanza, Chunn BAr and Wimpy breeding. 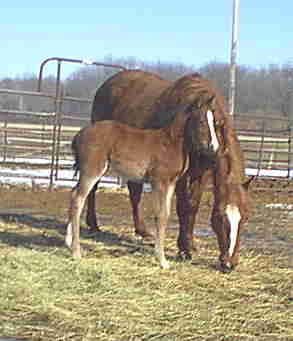 Dallas died this past year from a bout of colic. A very sad passing. She produced many top show horses who had big, floaty movement. We have her last daughter here who looks like she will step right into her mother's hoofprints. Rest easy old girl, they will carry on for you! offered to perform the euthanasia procedure for the old d og in their home. As we made arrangements, Ron and Lisa told me they thought it would be good the four-year-old Shane to observe the procedure. They felt as though Shane might learn something from the experience. accept Belker's transition without any difficulty or confusion. about the sad fact that animal lives are shorter than human lives. Shane, who had been listening quietly, piped up, "I know why." continued, "Well, dogs already know how to do that, so they don't have to stay as long." Author Unknown but much appreciated!